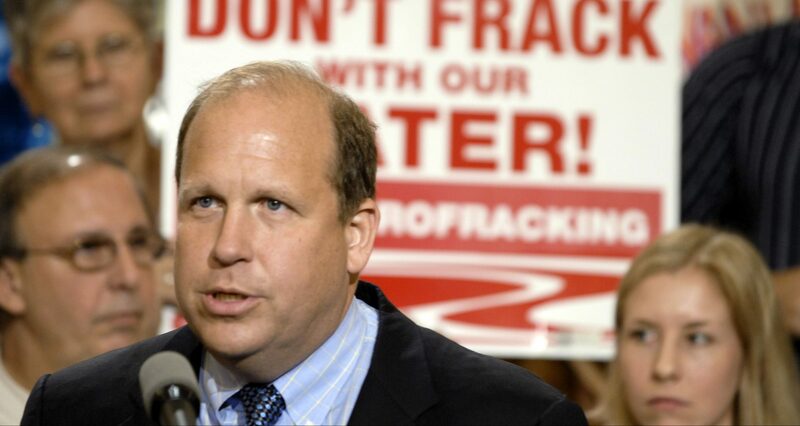 FILE - In a June 7, 2011 file photo, State Sen. Daylin Leach, D-Montgomery, addresses a host of environmental and community groups gathered for a rally in the state capitol against gas drilling in the Marcellus Shale natural gas formation in Harrisburg, Pa. Leach, who was the subject of allegations that he behaved inappropriately toward female employees and campaign aides, announced Saturday, Feb. 24, 2018 that he is ending his stalled congressional bid. He said he would instead remain in the state Senate. Joe Torsella says Leach’s recent statement about being uninvited from a school forum sounded, to him, like a threat of political retribution. A spokesman for Leach says it’s being misconstrued. (Harrisburg) — In an unusual move, Pennsylvania’s treasurer is calling on a state Senator to resign. The district uninvited Leach from a public forum this month, saying it was concerned the controversies that surround him might distract from education.